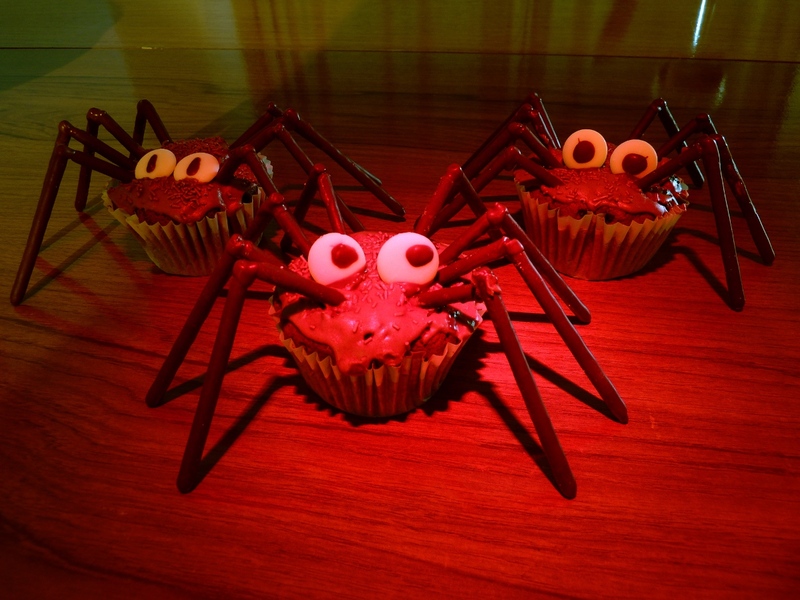 The chocoholics cure to arachnophobia. 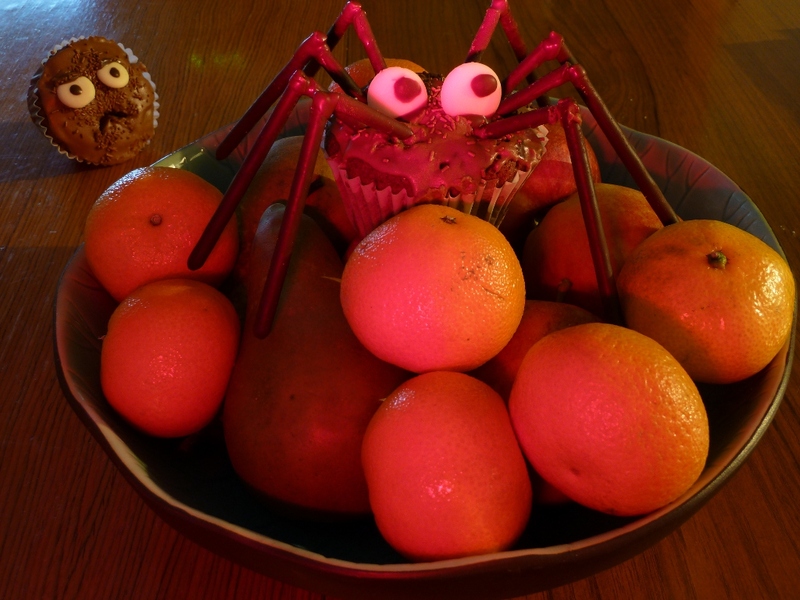 These cupcakes are richly chocolatey, zested with orange and thoroughly creepy. Sitting on the counter top they exude primal arachnoid fear. Yet like a fly to the web you are drawn in…. The recipe came from a Morrison’s Magazine. I don’t know how we found out that these were in it, and I don’t think I want to. Sometimes the wise culinary wizard must overlook the evil of the mystic tome and the suspicious circumstances by which it was obtained, because the spells inside look and taste so good. But it does bear repeating, because they look so good and because we tweaked their recipe ever so slightly. Beat butter and sugar until smooth. Sift in flour and cocoa powder into a separate bowl. Add the egg slowly to the butter mixture and beat, whilst slowly folding in the flour mixture. Add the orange zest and chocolate chips; mix and put into muffin cases (filling to about two-thirds) and bake for 20 minutes at 180 degrees celsius, gas mark 4. For the buttercream, mix the cocoa and water into a paste, beat the butter and mix in the sugar then the cocoa mixture. Spread over the cakes and add chocolate sprinkles. To make the legs, pierce the body with a cocktail stick or similar to make a hole. Cut half the mikado sticks into long pieces (2/3rds length of the full piece) and the other half into shorter pieces (1/3-1/2 of the full piece). You can extend the chocolate covered region to the whole stick if you coat them in melted chocolate but it is easier to use many mikado sticks. Insert the shorter pieces at an angle; then dip the longer pieces into the melted chocolate and place on to make a joint. Leave the legs to cool when all are added. The eyes can be made by drawing a pupil with melted chocolate on the button. Place as appropriate. Recipe: See above, or look at Morrisons Magazine Sept/Oct 2010. www.morrisons.co.uk/magazine may lead you there but we found it rather frustrating to navigate. The only thing missing from chocolate cake is alcohol. Rectified! Chocolate Gateau soaked in rum. 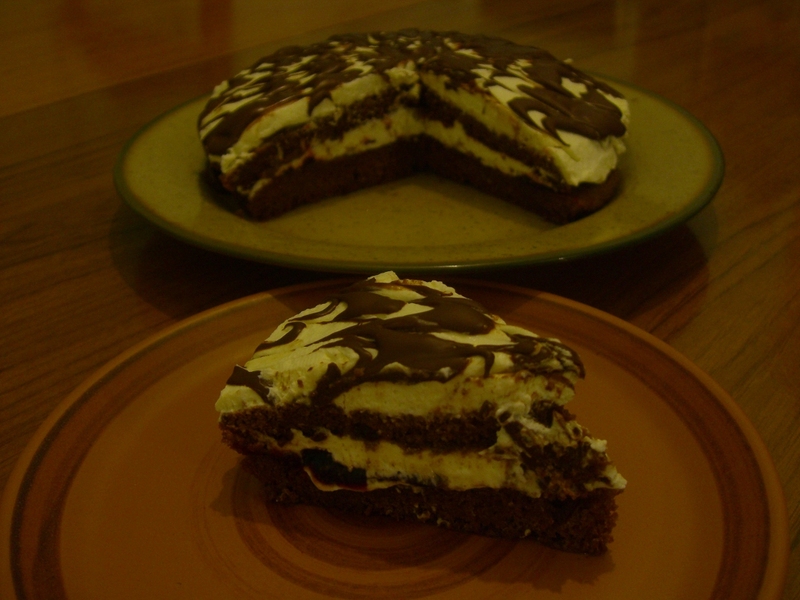 This is a fluffy chocolate Gateau that has been soaked in rum, covered in cream and then more chocolate. 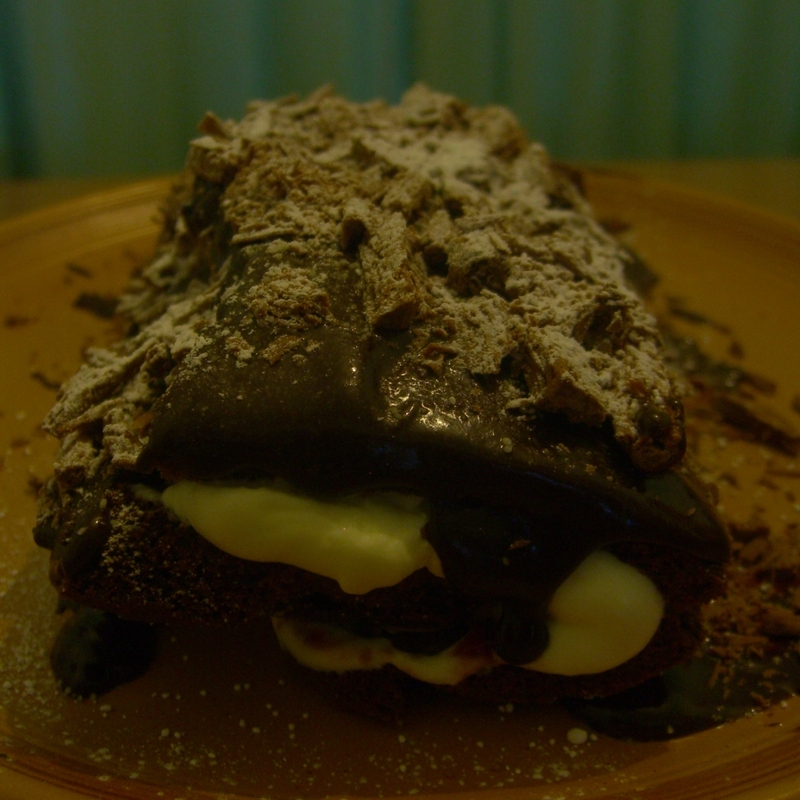 There is a layer of jam in there too – we used cherry jam which goes very well with alcoholic chocolate. Oddly enough, it is one of the few cakes that improves on the second day, presumably because the rum soaks through more uniformly and takes the tartness out of the cream. We had to adapt the recipe a little to make it for two people (the book gives a recipe that serves 20…) so I’ll give what we used in full. whisk the eggs and sugar together “until double in size” and a thick creamy texture (takes about 3 minutes, and keep the bowl warm by placing over some boiled water); drizzle in the oil slowly whilst whisking. Sieve the flour, drinking chocolate and cocoa together, then fold gently into the egg mixture. Bake at 220 celcius for 12-15 minutes until the centre springs back when touched and the mixture is set throughout., then leave to cool. Dissolve the coffee in the boiling water, add the rest of the water and the rum. Drizzle half of the liquid over the base of the sponge, and spread jam on generously. Then spread on 1/3rd of the cream, put the top of the cake on and drizzle over the remaining rum mixture. Spread the remaining cream on top, then melt the dark chocolate and drizzle on top in concentric circles. The marbled effect is created by dragging a cocktail stick radially out from the centre. 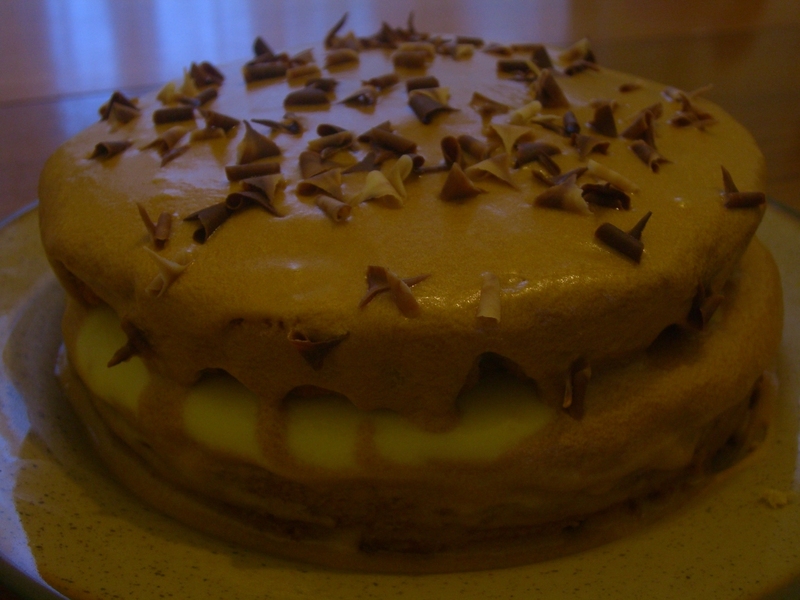 I wasn’t a fan of the tartness of plain cream on the day we baked it – perhaps adding some sugar (25g? ), or perhaps some more rum before whisking would sweeten the deal. But I would say that it wasn’t a problem on day two because the rum soaked up from the top and bottom into the cream. It makes a great pudding style cake, spongy and moist. Mmm. 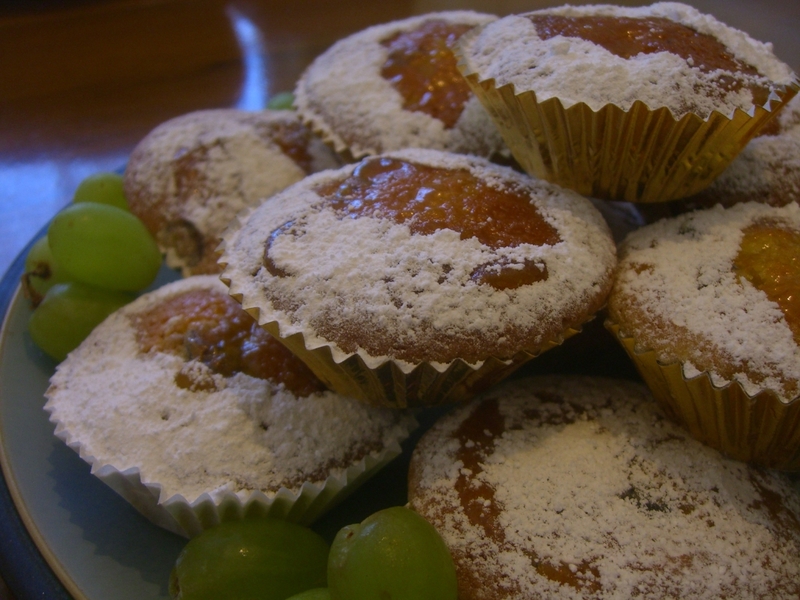 These are fruity cupcakes, spread with apricot jam and sprinkled with icing sugar in a decorative pattern. Christmas powered cupcakes. So what that it is only October? We're practicing! in a bowl, spoon into paper cases and bake for 25 minutes at 180 degrees celsius (or until risen and just firm). When cool, spread thinly with apricot jam, cut a piece of baking paper into the shape of a holly leaf and place in the middle of each cake before sprinkling with icing sugar. These cakes clearly have the Christmas look and are pretty tasty too, though as with all cupcakes should be eaten as quickly as possible after baking. I’m serious: they are divine for about 2 hours, amazing for a day, fine for a further day and simply tasty for another couple of days. You wouldn’t choose food that was just “fine” over food that was “amazing” would you? So get them down you on day one! Recipe: “Fairy cakes” by Joanna Farrow, page 27. 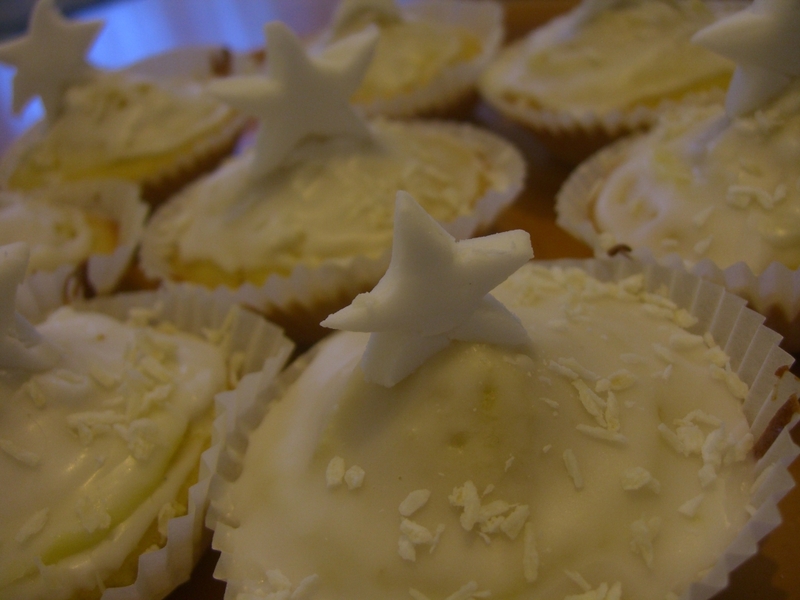 Cupcakes with Christmas Stars on them, cunningly named Christmas Star Cupcakes. These little guys are tasty little treats. Consisting of the usual cupcake, you cut out the top like with butterfly cakes, fill it with buttercream, pop the top back on upside down and then smother the whole thing in icing. A little icing star and some coconut curls create an attractive finish. Every time we make these, Anna uses her cookie cutter to make the stars which are the same size as the cakes themselves. So I have to cut them back down to size… sigh! Who made it: Anna made the cake, Dan helped with the decor. Recipe: “Fairy cakes” by Joanna Farrow, page 28. The so called "chocolate log": chocolate shaped like a log. Although concealed in the photo, the cake did not set flatly in our woeful oven leading to a rather lopsided log. Apart from that it came out perfectly, being very soft and deliciously chocolatey. Recipe: “Simply Cadbury’s Chocolate”, page 116. For no obvious reason we decided to make pie this weekend. Awesome idea. Pie, the way pie should be. Good pie is a rare and wonderful thing when you are vegetarian. For some reason, many restaurants don’t get that vegetarians do eat pastry. Last I checked, there were no little pastry farms with little baby sausage rolls, many of which are killed before their time and frozen for parties but some are allowed to grow up into those jumbo sausage rolls you get from bakeries. Maybe I’m just a pastry farm denialist – I also deny that chips are caught by chip trawlers in giant nets as they graze the algae in the oceans, forming giant schools and being preyed on by cod and dolphins (but its OK because they lead happy chippy lives). That would explain why so many places are reluctant to serve chips to vegetarians – they are looking out for our moral wellbeing. After all, that chips come from potatoes is just a “theory” that scientists “believe”. So anyway, we made this pie. The recipe called for home-made short pastry, but we had some flaky pastry in the freezer so we used that instead. A great tip – bake the pastry bottom for 5-10 mins before you add the filling – it makes it crisp up perfectly, and stops it sticking. 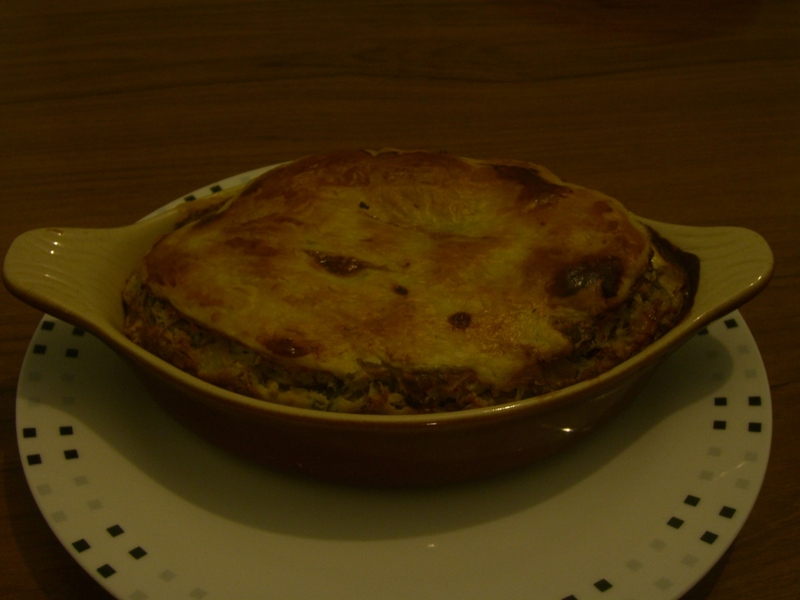 The centre was onion, egg, walnuts and Stilton (we also added some butternut squash), which works really well. I think next time I’d try a larger variety of veggies, and would swap out the blue cheese for smoked cheese (e.g. Applewood). Blue cheese is great, but it does overwhelm the other flavours a little. It is a great vegetarian recipe though – the nuts and egg lead to a meaty texture that is very satisfying, and the cheese adds good flavour. Very impressed and would try this again! We had it with some boiled potatoes, carrots and brocoli, all sautéed for a little extra flavour. Very much yum. Recipe: modified from “Regional recipes and reflections” by Susan Over, page 64. Mmmm, sweet wonderful banoffee pie. The old-English* for perfection is written "banoffee". This particular banoffee pie was a mixture of several recipes: A co-op leaflet, mixed with the BBC food recipe. I think we scored the best of both here. For a 7″ tin we made the base by melting 50g of butter into 100g of digestive biscuits, then pressing the mixture into the tin and baking for 10 minutes. Then we put 1 small banana chopped up into pieces on the base, and covered with the toffee mixture: 200ml of condensed milk, 50g of buter and 50g of golden caster sugar, heated together in a pan until it boils then simmering for 5 minutes until the consistency thickens and the colour changes to a rich caramel. On top of the toffee we added another layer of banana and refridgerated the lot. To serve, you add 125ml of whipped cream and drizzle with chocolate sauce (we used a pre-made pack, but 20g of melted dark chocolate would be fine). Mmm, banoffee.,, this stuff is death on a plate, there is no way you can say no. Definitely one of the better banoffee pie recipes out there. There are alternative things to try here: different types of caster sugar produce different toffee flavours, and I’ve seen suggestions for putting ginger or cinnamon in the toffee. Then the cream can be flavoured in many ways too – I can imagine a baileys or Tia Maria flavour working very well. Then the BBC recipe suggests using oaty biscuits instead of digestives; intriguing. That there is 32 different banoffee pies – its my hope to try them all this year 🙂 What? Its less than one a week! 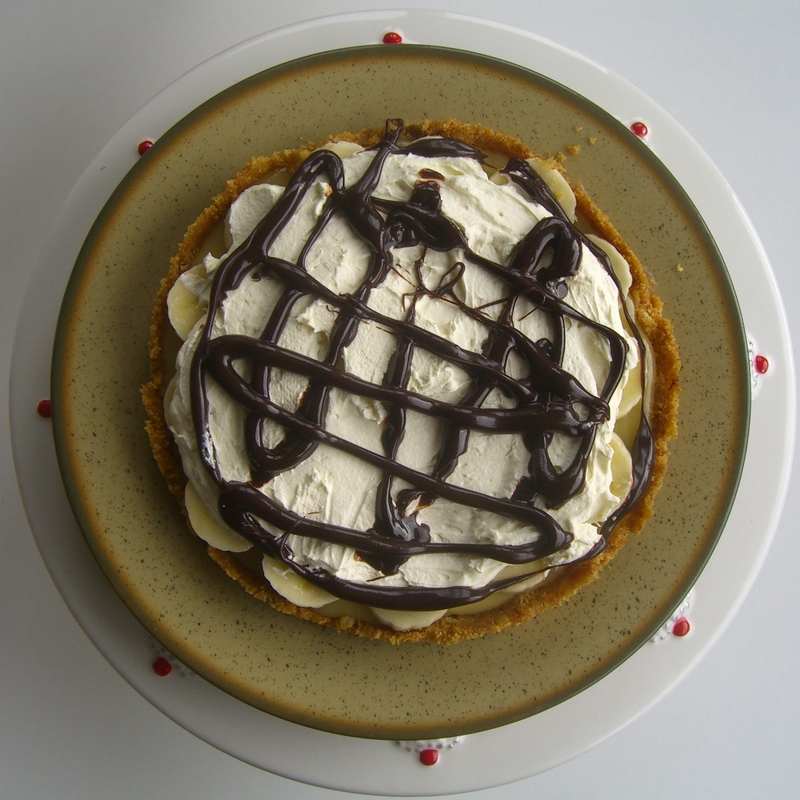 *: The banoffee pie is actually an English adaptation of an American recipe. See, who said trans-Atlantic cultures couldn’t learn anything from each other? Recipe: Mysterious internet mixture of ideas. See above for details. Like baked potatoes, only stuffed. Baked potatoes, stuffed. What, you expected something else? See also asparagus and pea fricassee, which was a good deal more exciting. These stuffed baked potatoes are for those with a delicate heart. No surprises await within these skins. Basically, you get some potatoes and bake’em. Then instead of smothering in cheesy goodness like any sane person, for some unknown reason you scoop out the potato, mash it, mix it with some (butter fried) onion and some sweetcorn, and put it back in the shell. Then it gets baked, again (though admittedly with some of that cheesy goodness I was complaining was lacking). Why you should do any of this is a mystery, because it tastes exactly like baked potatoes, with some onion (and sweetcorn). That is not a bad thing, of course, but I would usually expect enough cheese so that I can’t see my potato any more. Not so here – there is just enough cheese to remind what cheese can do to a potato – if it had been good. This potato wasn’t bad – it didn’t rob anyone, and it paid its taxes – but it wasn’t a saint either. It did not help little old ladies across the road. It probably laughed, just a little when nobody was looking, when said little old lady fell over. What? I appear a little distracted? What was I talking about again? Next time I’ll bake them as usual then smother with butter and cheese and maybe fried onions. The saddest thing is that they looked amazing. But tasted no better than the sum of their parts. Recipe: “The daily cookbook” by Love Food, December 18th. The photo of this in the cookbook makes it appear to be just some veg, mixed up. I’m pleased to say that the end result is much more than that. 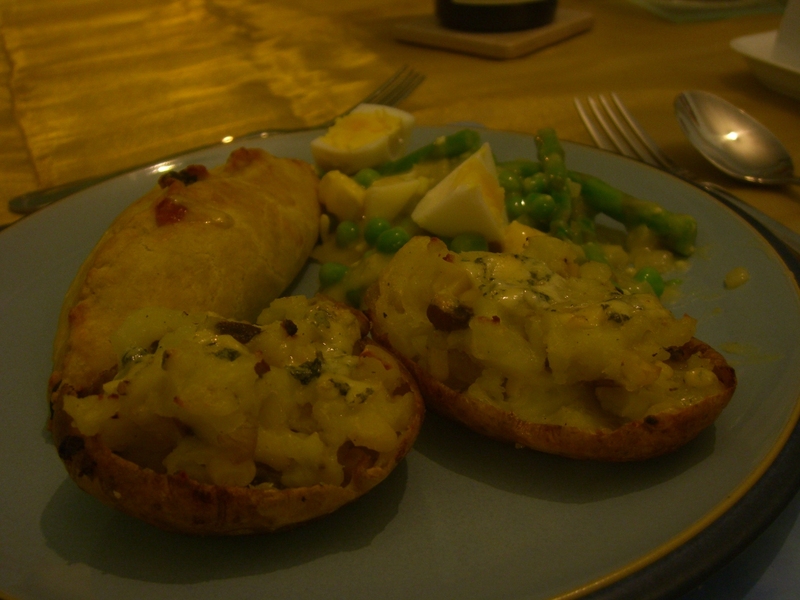 Asparagus and pea fricassee, Loaded potatoes and a pasty. Why not? The key to this dish is the sauce. It is 250g of shallots gently fried in 50g of butter, with 3 tablespoons of flour mixed in to make a roux. Then 200ml of white wine and 200ml of vegetable stock is slowly added (and at the end, it is seasoned) and the mixture gently simmered. (we halved those numbers). This results in a very pleasant and subtle flavouring that really complements the vegetable’s natural flavour. Surprisingly, the recipe suggests microwaving the vegetables themselves (250g of asparagus and 250g of peas). This works really well, leaving them tender but not overcooked, as is so easy to do when boiling or steaming. Of course, the (hard boiled) eggs are an optional extra – you could leave it out, or add something else. This was a great way to serve vegetables and we’ll be trying this or something similar again. Highly recommended! PS: In the picture you can see we had this with pasty. I don’t know why, I just thought it might be a good idea. It kinda… well it kinda wasn’t. The pasty recipe was from a leaflet and was fairly plain – it really needed tomato ketchup, lots of ketchup – which nothing else on the plate did… adding ketchup to these veggies would have been a food crime.